This whimsical Clown has been caught by the wind! It is the perfect ornament for a child or child at heart. 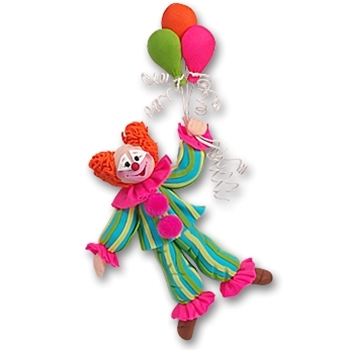 It is also a wonderful gift for anyone celebrating an event or is a clown collector. It may be easily personalized with a name, year or event and comes packaged in a clear acrylic pillow box that is great for gift giving & storing. As always personalization is FREE! The ornament is lovingly handcrafted from polymer clay and designed by Debi Allison. See photo below for packaging.